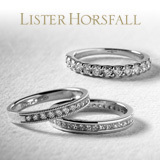 Lister Horsfall is an independent, family-owned company. Our team are here to help find the perfect item of jewellery for any special moment in time. We do things differently at Ingle & Rhode. We specialise in ethical engagement and wedding rings made here in the UK using only conflict-free traceable diamonds and Fairtrade gold or recycled platinum.